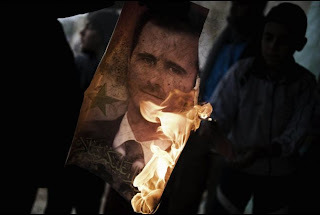 People become inured to reports of the carnage in the Syrian civil war, now entering its third year (arguably commenced on the Ides of March – appropriately – of 2011). Even fairly conservative figures place the death toll north of 70,000, showing that Bashar al-Assad easily passes the record of his pathological father Hafez, who slaughtered a mere 20,000 (the numbers of these things in the Middle East always varies) during the Islamist uprising in Hama in 1982 (smaller-scale massacres notwithstanding). The UNHCR estimates some 1.2 million refugees, mostly in camps across the border in Turkey and Jordan. The desultory news coverage here in America matches the more desultory attitude of Obama as it relates to Syria. The administration is frankly skittish after the failure of our feckless "lead from behind" approach in Libya and the MSM is loathe to dwell on it, in stark contrast to their treatment of the Bush administration. On those occasions when the evening news reminds us of the war, snippets of film will show a couple scenes of street fighting, which can give the illusion (so endemic to modern reportage) of isolated pockets of resistance. The actual extent of destruction is far more widespread. It has been my observation that a good number of reporters (with a few notable exceptions) are content to hunker down in barricaded hotels in Green Zones in Baghdad or Kabul, or Bahrain, and 'phone it in'. But more pieces of the puzzle can be gleaned from crews that actually embed themselves with units in action (as opposed to those who 'embed' themselves for an afternoon or so), and provide pictures that can provide the standard 1:1000 ratio with the reporter's wordy punditry. The footage is taken in the city of Darayya, a suburb of Damascus, which previously had a population of some 75,000 but which has been hammered almost from the inception of the war. The destruction more than rivals my memories of Beirut, where each time I would see it, I would tell myself that it couldn't get any worse (but it always did), or Kuwait City in February 1991 (retaken from the Iraqis so quickly that there was no time for larger-scale destruction). The reporters definitely have a pro-Assad bent (as do the Russians, for a variety of reasons) and allow their tanker interviewees to vent the usual patriotic duty propaganda about going after the "foreign mercenaries and terrorists" (which, admittedly, does contain more than an element of truth but is hardly all-encompassing). The ANNA crew earlier posted a very interesting interview with a Syrian tank commander, in which he is very candid about maintenance problems and strengths and vulnerabilities of his T-72M1 tank. A lot of their previous efforts, as this one, involves affixing a camera to the turret of a Syrian T-72 as it drives through the abandoned and gutted areas of Darayya, often in conjunction with other tanks and (it would seem and one would expect) APCs with infantry troops in support, pumping tank rounds into structures where they have drawn fire from the rebels. In this particular piece, we see a spectacular kill of a tank to the immediate front of the one with the mounted camera, with the kill shot technically off-camera but large enough for the viewer to comprehend the magnitude of the blast. It is shown twice, introduced at about 1:00 and covered more extensively starting at about 4:12 with the shot sequence starting at 5:27. In both sequences the camera captures the lead tank as they sweep an area and engage rebel troops with tank rounds and the co-axial machine gun. The camera sweeps to the left and we see a portion of the enormous blast to the right. The camera then slews back to the right where we see the burning tank, with its turret blown off and slightly rocking off to the right, whereupon the tank with the camera then fires a main round at the structure from whence the kill shot was fired. The upgraded RPG round probably hit the small 'sweet spot' of the turret ring near the mantlet (the area surrounding the main gun), a feat of extraordinary skill or blind luck. At 6:03, we then see the rebel anti-tank crew, carrying a modern RPG-29 system, maneuver into position to repeat the process but from the viewpoint of the other side. They clearly survived the return fire (one doesn't stick around after announcing one's position so flagrantly), but apparently return to film the burning turret afterward. The narration, in Russian, speaks of how they have lost their friends ("Eternal memory to the heroes"), and how enemy snipers forced the accompanying infantry to pull back and leave the tanks exposed. (Tanks and infantry should always operate together as a team. The edited footage shows that the two principle tanks involved seemed to have overstayed their welcome by remaining in one spot for far too long.) The narrator goes on to question why it is that the "terrorists" have such advanced Russian anti-tank weapons when even the Russian army is under-supplied, and questions why a defense against such systems isn't supplied to Russian troops and their allies. My interest was piqued and led me to discover another piece of footage, this time with the same RPG-29 fired from a rooftop into the right engine compartment of a tank, spectacularly igniting the fuel supply. Within moments, the tank rounds begin cooking off. Another piece is also filmed in Darayya, but this is a perverted Middle Eastern version of a human interest story, with a female anchor and her film crew walking through an area of carnage. The footage is attached at the end of a story in the Global Post – I can't attach it separately since I can't type in Arabic script, but I wouldn't anyway (if you wish, go to the link). The scenes shock the conscience (to use a term of art) of a modern Western sensibility, but are rather commonplace in much of the world. The purpose of the footage, broadcast on Syrian television, is to blame this horror on the "terrorists and mercenaries" of the rebel army, but the story places the blame on the Syrian Army's 4th Division, commanded by Bashar al-Assad's brother. Scenes that linger in the mind include an interview with an old woman, prostrate in a graveyard and surrounded by bodies, "her bloodstained hands a stark contrast to the reporter's manicured nails"; or an interview with frightened and bewildered children, certainly no older than five, apparently lying next to their dead mother; and a familiar repeat of the standard footage of a gaggle of troops standing upright in the open, bravely firing at what the reporter claims is the enemy, fortuitously occurring at the moment when a film crew is there to record it (American reporters and film crews mastered this technique in Viet Nam). Interspersed are scenes of Syrian troops very obviously helping the wounded, barely resisting the opportunity to mug for the camera. 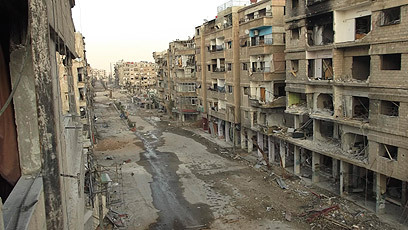 The situation in Syria can be as complicated as its culture and its history, with its mixture of Sunnis, Shiites, varieties of Christians, Alawites, Druze and others, with the brutal Assad dynasty and its ties to the minority Alawites cast in the strange position of being a secular bulwark to protect the ancient Christian population against the rebels dominated by Islamic Supremacist groups such as the al-Qaeda affiliated Jabhat al-Nusra. Russia, with its Orthodox church becoming increasingly prominent in internal politics, supports Assad in this role as protector of the Christian community that has been subjected to massive and increasing persecution throughout the Middle East, and this is just one of the reasons for Russian support. Yet at the same time, Iran is keen to protect Assad as its principal ally and means to support its Hezbollah proxy in Lebanon. The Free Syrian Army is riven between factions that are increasingly surrendering to the more radical Jihadi elements in the face of the intransigence of the West, particularly the current US administration. The revolutions in the Arab countries such as Egypt and Libya (as well as our fading influence in Iraq and Afghanistan) are becoming increasingly driven by Islamic Supremacists, and the MSM is using the term 'Arab Spring', emblematic of an Obama administration's success in the Middle East, far less frequently in the forlorn hope that people will forget that the pre-election enthusiasm for the idea will just disappear. But Syria is already becoming the most prominent example of the growing anti-Western and anti-Christian jihad, and it promises to get even worse.